The pool was spacious. Close proximity to park and train. Breakfast was plentiful but same everyday. I’ve been coming here since this hotel was built, although it’s been a while since my last visit. It’s a great hotel, rooms are basic but clean, lots of closet space and a safe - no coffee or tea in room but there is a kettle and free coffee and water available in the hotel. Buffet meals are amazing, varied and plentiful although you have to pick a time period to eat and this applies throughout your stay. Staff are friendly but sometimes restricted by the language barrier. Can be noisy at nights but that’s what you get for staying in a theme park hotel. Pool was lovely but closed early (6pm) I guess we were slightly out of season. Short walk to the theme Parks, and about 15 minutes walk into town. 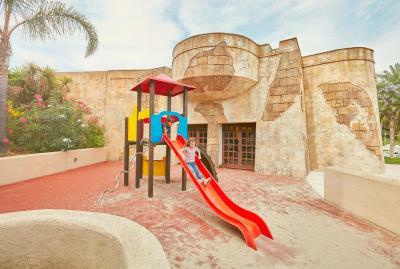 I like our stay at the hotel because its near at the play park. Hotel staff extremely friendly and approachable. Great location for the park, and entertainment at night on the stage. Breakfast had great selection. 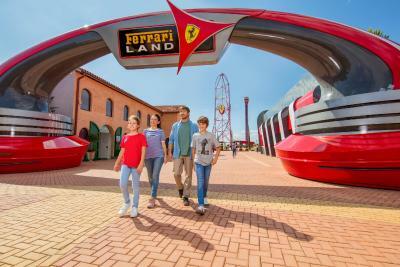 Theme park tickets included, hotel offered great deal on Fast Passes. 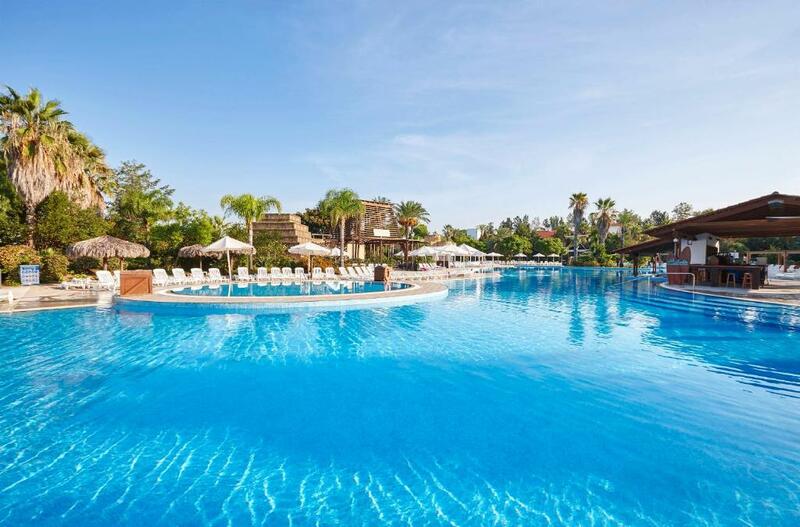 Huge pool with plenty of lounge chairs and sand area. Good breakfast and dinner options, nothing fancy but good variety. Location is great. Friendly staff. Pool is very nice. it is very close to the park. for a first time it is the best thing to do. 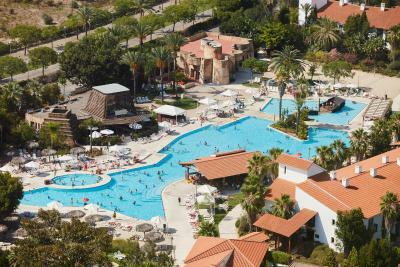 PortAventura® Hotel El Paso - Includes PortAventura Park Tickets This rating is a reflection of how the property compares to the industry standard when it comes to price, facilities and services available. It's based on a self-evaluation by the property. Use this rating to help choose your stay! 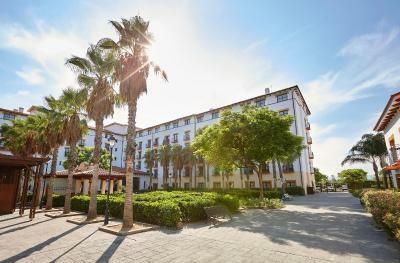 One of our top picks in Salou.El Paso Salou is a hotel within the PortAventura Resort, and offers free unlimited entrance to the PortAventura theme park. 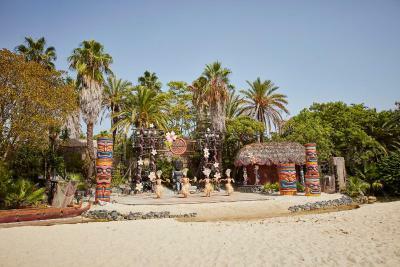 It is styled on a traditional Mexican hacienda, with Aztec-inspired décor. 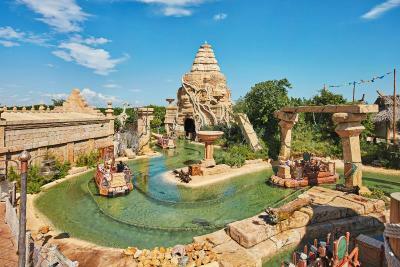 Hotel El Paso Portaventura’s outdoor swimming pool features loungers and a sunken pirate ship in the middle. There are also children’s pools. 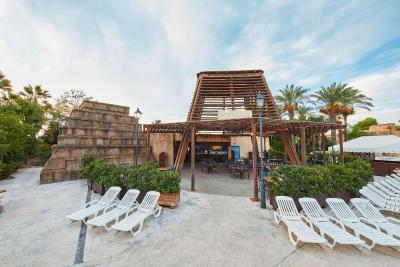 For a supplement, guests have access to the Hotel PortAventura & Hotel Caribe Wellness spa. This if free for some room types, where indicated. 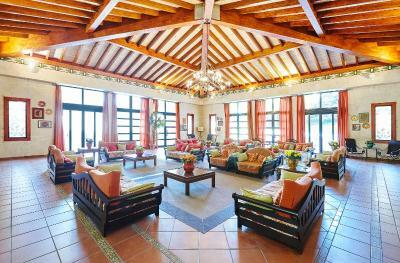 Services include a sauna, hot tub, steam baths, gym and heated indoor pool. 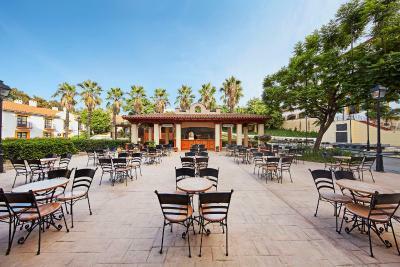 Located 1 hour's drive from Barcelona, El Paso Hotel Salou consists of various buildings set around a central area with gardens, terraces and the pool. 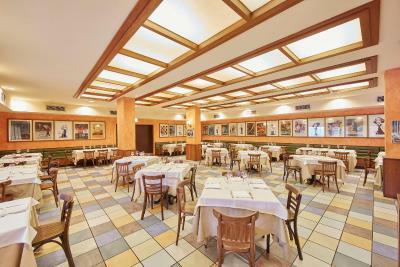 It is 350 feet from the Train Station on the Barcelona-Valencia line. 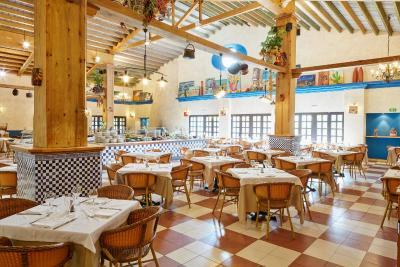 The all-included rate offers lunch and dinner menus in the hotel’s Mexican restaurant or in PortAventura Park, applicable to designated food outlets and subject to opening hours. 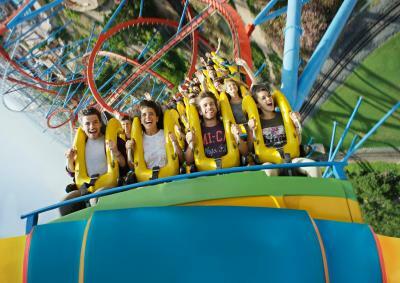 PortAventura Theme Park main entrance is just a 5-minute walk from PortAventura Hotel El Paso. The hotel has its own train station. 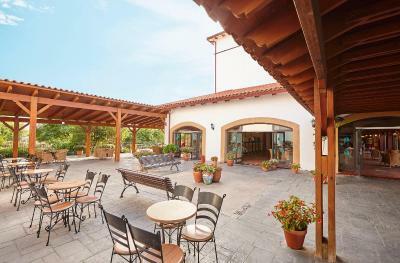 It is just 20 minutes' drive from the high-speed train station, 2.2 mi from the A-7 motorway and 10 minutes' drive from Reus airport. Barcelona airport is an hour's drive or train ride away. 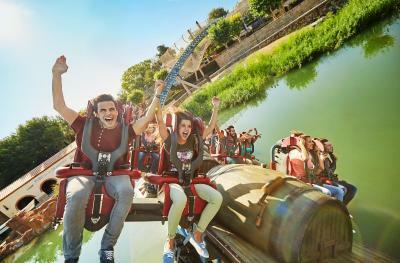 When would you like to stay at PortAventura® Hotel El Paso - Includes PortAventura Park Tickets? 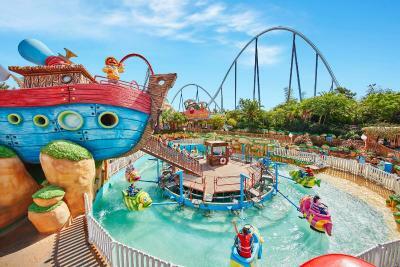 This rate includes free unlimited access to PortAventura® Theme Park and a discount for Costa Caribe Aquatic Park (please check the parks' opening calendars). 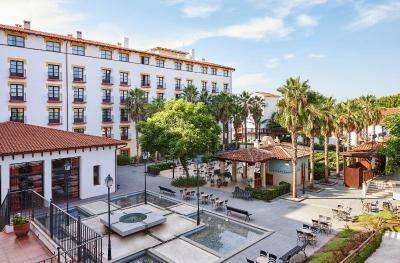 This 4-star hotel transports you to an authentic mexican hacienda, at only one-hour drive away from Barcelona. 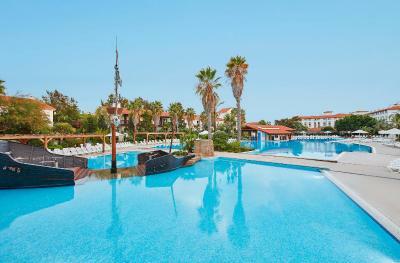 Surrounded by spectacular gardens with exotic plants you will find the different buildings which constitute the hotel, as well as two crystal-clear pools, a shopping area and a games area. Our convenient all-inclusive rate will make your stay unforgettable. 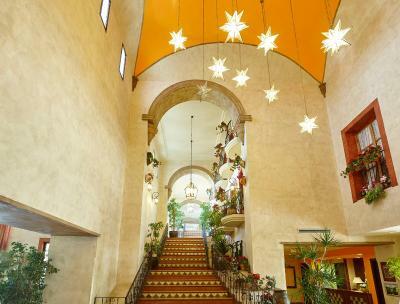 Offering 501 rooms, a buffet restaurant, an à la carte restaurant and three bars, we invite you to experience colourful Mexico at Hotel El Paso! 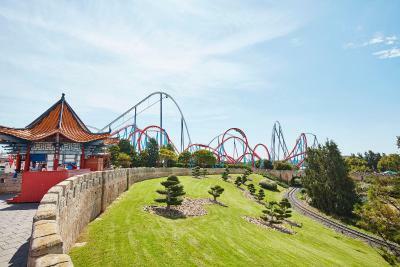 House Rules PortAventura® Hotel El Paso - Includes PortAventura Park Tickets takes special requests – add in the next step! 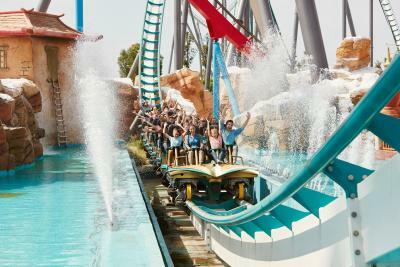 PortAventura® Hotel El Paso - Includes PortAventura Park Tickets accepts these cards and reserves the right to temporarily hold an amount prior to arrival. 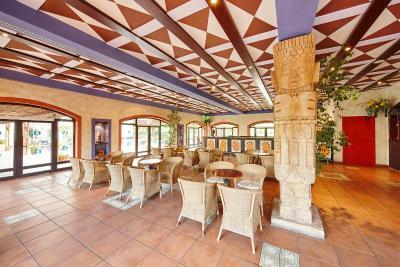 - Spanish brands of alcoholic drinks are served between 12.00 and 23.30. 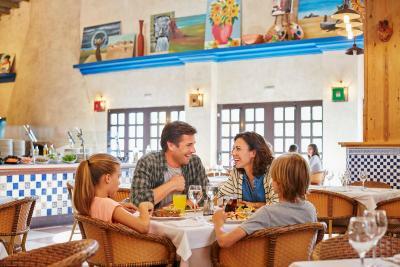 - Soft drinks are served between 10.30 and 23.30. - Snacks are served between specific times. Please ask reception for more details. Certain brands of snacks and drinks may be subject to a supplement. For reservations on 24th or 31st December, a buffet dinner is included. During the 31 December, there is a gala dinner in the hotel's restaurant, party favors bag, and after dinner party at the Convention Center (transfer included). it is too expensive for the time spent in the hotel. 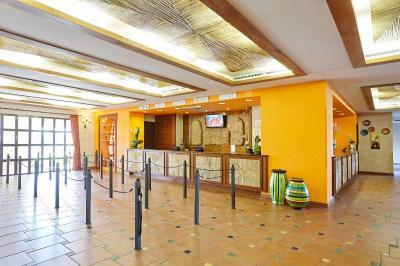 check in at 3pm and check out at 11 am.the staff knocked at the door at 9.30 of the morning to ask if we are leaving!!! The hotel key given did not work, had to re queue for 15 mins again to get into room. The safe didn't work, had to wait 30-45 mins to put things in. The lift dropped when in it several times, daughter was shaking and crying. Rang emergency bell as trapped no one bothered to come from reception. Lucky a French lady also stuck in lift called reception to get us rescued from lift. Flies in the room. Location is perfect. swimming pools very nice. the baby cot was comfortable as well. We just loved the hotel! Amazing location, great services, fantastic breakfast and so close to the PortAventura! We will be back for sure next year! Thank you very much ! The communication with staff was lacking. Was given room away from remainig family after requesting one close to them. Then the next day was roomless for 6 hours waiting for another room. Was given misinformation. English was not a language they spoke very well so communication was challenging. Staff was not very helpful with inquiries about travelling into Barcelona. Bathtub plugged. Not cleaned thoroughly on a daily basis. No refrigerator in room. Breakfast was disappointing for a so called 4 star hotel. Juices were not fresh at all. Coffee from machines. Few healthy options. The staff we're very friendly, from reception to cleaning staff. Room cleaned every day. Kettle in room. Air conditioning good.